Paris, France’s capital, is a major European city and a global center for art, fashion, gastronomy, and culture. Its 19th-century cityscape is crisscrossed by wide boulevards and the River Seine. Famous for the beautiful monument, with iconic status “Eiffel Tower”, the Eiffel Tower is more breathtaking in person than it is in all the amazing photos you’ve probably been scrolling through.Thus, Book cheap flights to Paris with a hot deal of FaresKart. 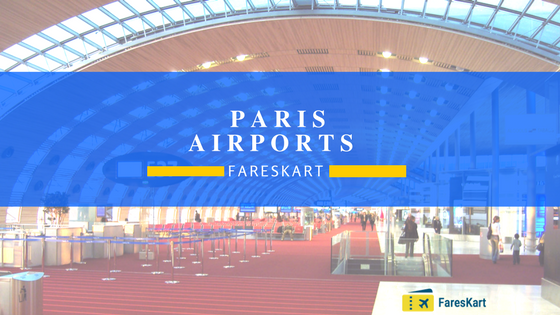 Fareskart has brought in the depth information of Paris International Airports. Here is a list of major International Airport. Paris Orly Airport (ORY/ LFPO) is the second-busiest airport in France by total passengers annually (28,862,586).The flight operates to destinations in Europe, middle east, North America and Southeast Asia. Whereas its 26 km away from central Paris and 13 km away from South Paris. Terminal S (South-Sud) and Terminal W (West -Quest). Whereas Terminal S has divided into 6 levels. Level “0”: Arrivals. Has gates A, B, C, K, and L.
Level “1”: Departures. It has an Airside Two Areas.A and B Gates. Level “2” “3” “4”: Offers to Ohere services. Whereas Terminal W has divided into 2 floors. Level “1” : Departures.Link with 4 sections contains gates 10A-10P, 20A-20L,31A-31F and 40A-40G. Paris Charles De Gaulle Airport (CDG / LFPG ) also known as Roissy Airport, one of the largest international airport in France. Also, it is World’s 10th business airport. The first terminal, designed by Paul Andreu, was built in the image of an octopus. It consists of a circular terminal building that homes key functions such as arrival counters and baggage claim conveyors. This Terminal is divided into sub 7 terminals. -Terminal 2G: dedicated to regional Air France flights and its affiliates. -Hall L (Satellite 3): 750 m (2,460 ft) long Satellite 3 (or S3) whereas Terminals 2E and 2F provide further jetways.